Harajuku girl with round sunglasses wearing a monochrome outfit with midi dress, metallic collar, heart shaped bag and rocking horse shoes. Japanese idol in a cute pastel outfit with pink coat, heart shaped bag, pink creepers and handmade accessories. Harajuku girls with long hair, wearing mini skirts, dark colors, Tokyo Bopper booties and faux leather. Japanese oshare kei singer with rainbow hair and fairy kei fashion on the street in Harajuku. 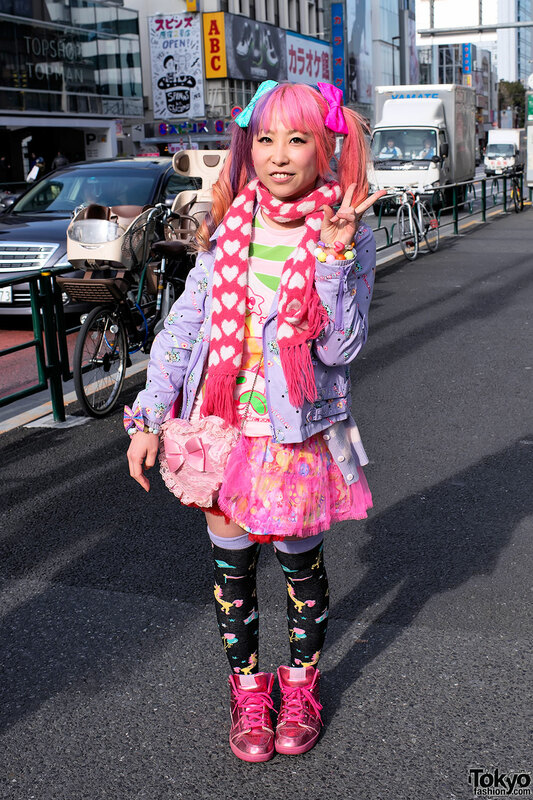 Harajuku girl wearing a fairy kei-friendly outfit with colorful tulle skirt and pink beret. Harajuku girl in purple hair and pastel outfit with creepers and heart shaped bag. Two friends in Harajuku, one wearing a WC faux fur coat, the other a WEGO macaron-print top. Cute Harajuku girl in twin tails and bangs wearing animal print and Dr. Martens shoes.